Growing in Grace Podcast: 647. 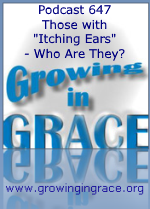 Those with "Itching Ears" - Who Are They? 647. Those with "Itching Ears" - Who Are They? With this message of the gospel of grace that we’ve taught and proclaimed over the years, sometimes legalistically based church-goers have accused us of sharing a message of cheap grace, easy grace, hyper-grace, etc. (although they seldom understand the fullness of what we’re saying). They’ll warn the sheep about “extreme grace teaching” by referencing a phrase that the Apostle Paul used when referring to people with “itching ears” … seeking teachers who would turn their ears from the truth and be turned aside to myths or fables (2 Timothy 4:3-4). Paul used the same language in his first letter to Timothy when he warned against such teachers. But was Paul warning against those who would wander from FAITH by teaching grace to an unbalanced extreme? No, he was warning people against those who desired to be teachers of the LAW. Galatians tells us the Mosaic law is not of faith, but many with itching ears would be turned aside by such teaching that will focus more about them “doing” instead of believing in what Jesus has done. And what about those who have had their own “conscience seared with a hot iron?” A reference to sinful activity or is it something else? It’s all part of our discussion on this week’s program.